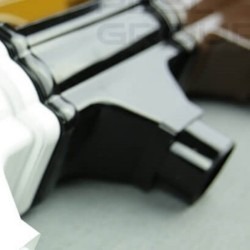 Our Black Ogee Gutter is manufactured by FloPlast, the market leader in the UK. 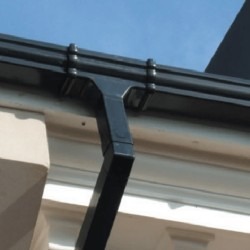 Black Ogee Gutters are mostly popular on period buildings or new build installations with either white fascia boards, as the contrast between the gloss black and white at the eaves level is particularly eye catching. Black Ogee also looks effective against a Black Ash Fascia system (these are becoming more and more popular). Black on black looks quietly distinguished, a very different look to the almost "Tudor" effect of Black on white. We think both have their place, it is all a matter of personal choice and of what sort of overall visual effect you are trying to create for your property. 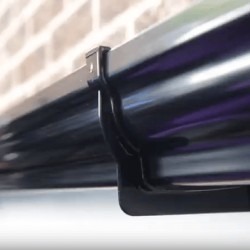 We stock a wide range of Black Ogee Gutters with a 10 year colour guarantee.